Sometimes they're visible, more often they're behind the scenes. But the important role they play is clear: band boosters are essential to the success of high school marching band programs. At the Pasadena Tournament of Roses Bandfest, held in conjunction with the 2010 Rose Parade, dedicated band parents were everywhere. From the front gate to the staging area, parent volunteers embraced their roles with enthusiasm. And students were quick to acknowledge the boosters' efforts. "Without the band parents, we could not do half of what we've done," said Kathryn Wolske, a clarinet player with the Marian Catholic H.S. Band from Chicago Heights, Illinois. "They deserve a huge thank you. Throughout the year they lead fundraisers. They cook our meals at competitions. They're here for us night and day," Wolske said. "We definitely know how hard the boosters work." On this particular trip, Wolske's parents didn't have cooking duties. Instead, her parents were leading a "shadow tour" of nearly 150 supporters who flew from wintery Chicago to cheer for the Marian Catholic band during its Tournament of Roses appearances. Some parents were filling true hands-on roles at Bandfest. 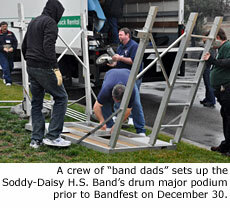 In a parking lot just outside the stadium at Pasadena City College, band dads from Soddy-Daisy, Tennessee were unloading pit equipment and assembling a drum major podium. Scott Morgan, whose daughter plays baritone in the Soddy-Daisy H.S. Band, was pleased with how well the logistics had worked, considering the band was 2,200 miles from home. He praised the support of Covenant Transport, which is headquartered in Chattanooga, Tennessee. "Covenant Transport brought all of this out here for us," Morgan said. "We loaded the instruments, equipment and luggage on December 22, and they brought it from Tennessee to California." Since all large items were shipped in advance, the band members, staff and boosters were able to fly with minimal luggage. The 12 guys on the equipment crew for this trip were working hard, but they were having a good time, too. The trip itinerary included stops at Universal Studios and Disneyland, in addition to the Rose Parade and Bandfest. But right now they were focused on getting everything set up in time, because one of their duties was to roll the pit equipment to the field for the Bandfest performance. The front entrance for today's Bandfest opened one hour before show time, but spectators had started forming a line more than two hours in advance. Near the head of the line was a group of parents wearing pins and jackets that made it clear they were supporters of the El Dorado H.S. Band from Placentia, California. Marjorie Blaes, Tina Haines, John and Sara Sperling, and Danette Stephen arrived extra early to ensure they would be able to cheer for their band from great seats near the 50 yard line. "Being in the Tournament of Roses is a huge honor," John Sperling said. "We've always said it's like the Super Bowl for marching bands. This is our second time, and we call it our 'sweet repeat.'" The contingent for El Dorado was especially large, because unlike some bands that flew from across the country, they had an easy drive from El Dorado H.S. which is located just 40 miles from Pasadena. 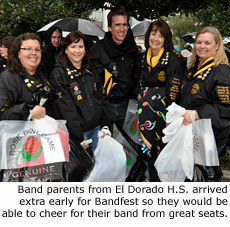 Stephen estimated there were already more than 50 El Dorado parents in line with them for Bandfest, and she said the band had ordered 600 tickets for the prime grandstand seating along the Rose Parade route. Haines said that simply being present sends a message to the students that what they are doing is important. "Sometimes my kids don't even know we're coming, and all of a sudden they look over and see us," Haines said. "They love it. They know that I support them in everything they do, and no matter where they go, I'll be there." One reason parents are so supportive is that they know participation in band is good for their child's future. Rhea Ann Weaver, band booster president for Soddy-Daisy H.S., says the payoff goes far beyond this single trip to California. "One of the most important things band members get out of a trip is their friendships. For this to be your core group of friends is a great thing," Weaver said. "And how fun for these kids to be in California! Eighty percent of them had never been on a plane before, and some had never seen the ocean." Raising $345,000 to buy new instruments and to bring the band, staff and chaperones to Pasadena was not a small task. Weaver credits the students and parents working hand-in-hand for reaching their goal. "The students are great," Weaver said. "They know the work involved because they're important to the fundraising process. We've had chili dinners, spaghetti dinners, a pancake breakfast, and you name it we've tried to sell it." But Weaver says the parents wouldn't be successful raising the money without student involvement. "When somebody looks at those great kids and sees what they do, they're going to give them money." Laughing, Weaver adds, "When somebody looks at a tired, worn-out band parent, they go 'yeah, yeah, keep moving'."